Image from Meir Amit report. Speaking to Palestinian BDS activists at the conference, Barghouti called on Palestinians to cut all ties to Israel while other speakers promoted "popular resistance" (or violence), the Meir Amit Intelligence and Terrorism Information Center reports. Barghouti specifically demanded that the Palestinian Liberation Organization (PLO), and Palestinian society as a whole end all relations with Israel. He also said that the BDS movement is against "members of the Zionist media" appearing on Arab media outlets. He even called for an end to security coordination, the most visible form of normalization between Israel and the Palestinians, despite Israel's success in shoring up the Palestinian Authority (PA) from Hamas attempts to take over the West Bank. Barghouti believes Palestinian security cooperation with Israel is a step towards wider Arab normalization – something he vehemently opposes. 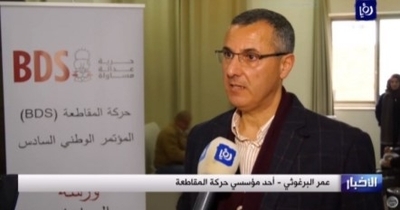 During the conference, Omar's relative Mustafa Barghouti, secretary general of the National Initiative Movement, admitted that anti-Israel activists sought to turn BDS into a "national culture" and integrate its ideals as part of the wider "popular resistance" campaign against Israel. In the conference's opening speech, PLO Executive Committee member Wasel Abu Yusuf similarly referenced BDS as an important component of the "popular resistance." Palestinian leaders of various stripes often invoke the term "popular resistance" as a veiled reference to terrorism and violent Palestinian campaigns targeting Israeli civilians. "No, we most definitely have a moral and legal right to an armed resistance against the military occupation of our land, even according to international law, as long as we attack legitimate targets, that is, the occupation, settlers (Israeli civilians) and people who are armed," Barghouti said in a 2010 interview with al-Adab magazine. Many BDS demonstrations feature extremists chanting calls for Israel's destruction. "From the river to the sea, Palestine will be free," "there is only one solution intifada (violent uprising) revolution" and "the people of Palestine will wipe the Zionist entity (Israel) off all the world maps," are just some of the slogans and statements picked up by exclusive IPT video of a December 2017 rally in New York City. Barghouti frequently visits Western countries, particularly the United States, to spread BDS-related propaganda and activities. He promotes a one-state solution to the Israeli-Palestinian conflict and "rejects the existence of a Jewish nation state," the Meir Amit report said. Like the BDS movement overall, Barghouti's main objective is to facilitate a "right of return" for Palestinian refugees and their families abroad to move to Israel and upend the Jewish majority. And like other anti-Israel activists, Barghouti couches his disdain for the Jewish state while speaking to Western audiences by invoking vague concepts like "democracy" and "justice." U.S.-based Islamists embrace a similar strategy and support the BDS movement's overarching objective of destroying the Jewish state. Council on American-Islamic Relations (CAIR) San Franciso chapter director Zahra Billoo, for example, acknowledged in November that she is "not going to legitimize a country [Israel] that I don't believe has a right to exist." She also has denounced Muslim leaders who oppose the Boycott, Divestment and Sanctions (BDS) movement. CAIR leaders from across the country often espouse blatantly anti-Semitic views. CAIR's Los Angeles chapter Executive Director Hussam Ayloush has referred to"zionazis" and openly called for Israel's termination, while Florida director Hassan Shibly refused to condemn Hamas and vilified "Israel [and] its supporters" as the "enemies of God and humanity." In September, a leading American BDS group, the U.S. Campaign for Palestinian Rights (USCPR), held a conference in which speakers minimized nonviolent ways to protest Israel. It is common for Islamists and pro-Palestinian activists to sanitize terrorist attacks as "legitimate resistance" at such events, but three USCPR speakers came right out and made a case for violence, going much further than "boycotts and divestment." One speaker, a university professor, made a point of praising a terrorist murderer, while then-CNN pundit and Temple University professor Marc Lamont Hill diminished non-violent protest as a path for Palestinians to follow by saying "this nonviolent thing" can be too limiting, and raising a question "what legitimate resistance looks like." The Meir Amit report makes clear what Barghouti and his BDS movement are about. It may be presented in softer rhetoric, but the goals are indistinguishable from Hamas, Palestinian Islamic Jihad, and other rejectionist groups: They want a world in which Israel has been replaced, the only distinction is whether that's done through mass terrorism or through deceit-laden boycott drives. To see the full report, click here.